Dr. Stamoulis graduated from Boston University before earning an MD from the Universidad del Norestre in Mexico. He completed a residency in internal medicine at Rhode Island Hospital, followed by a residency in neurology at Rhode Island Hospital, where he also completed a fellowship in neurovascular neurology and cerebral ultrasonography. 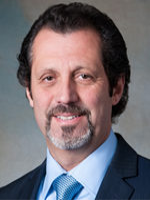 Dr. Stamoulis developed and headed the stroke center at Indian Path Hospital in Tennessee until 2003, when he returned to the South Coast region to head the stroke centers at St. Luke’s. Dr. Stamoulis is board certified in neurology and neurosonology. He is also a fellow of the American Heart Association Stroke Council.